Delivering high speed spinning reel performance just as its name suggest, the Lew's Mach II Metal Speed Spin Spinning Reel features a blazing fast 6.2:1 gear ratio. Perfect for a wide range of finesse and light line applications, it features a super smooth 10 bearing system (9+1) for consistently fluid casts and retrieves. 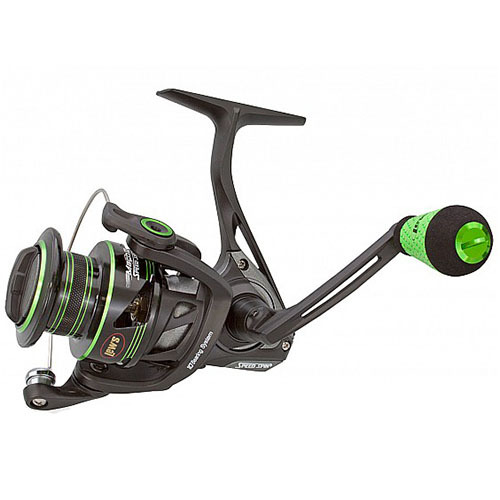 Its S-curve oscillation system also adds to the smoothness of the reel, and its lightweight Aluminum body and sideplate form a base that keeps all the moving parts in perfect alignment. The hefty six-disc drag system stays smooth throughout its range, and the quality brass gearing dishes out serious power to haul fish back to the boat. Each reel is also loaded with Speed Lube, which helps provide exceptional smoothness and uninterrupted performance in all weather conditions, from extreme heat to freezing cold. Available in a range of sizes, the Lew's Mach II Metal Speed Spin Spinning Reel delivers speed, precision and reliability at a great price.